We have found the most intriguing thing about these donkeys is their personality although their long goofy ears & VERY LOUD bray are pretty cool too. These little donkeys are native to the Mediterranean islands of Sicily & Sardinia. They have become nearly extinct in the land of their origin & have been brought to their current state of being an excellent breed by breeders in the US who have been breeding for size, disposition & conformation. They are on the Recovering list at the American Livestock Breeds Conservancy. 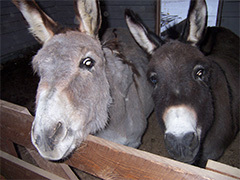 The size of these donkeys range from 26 inches, considered extraordinarily small, to 36 inches at the withers. Their average height is about 33-34 inches. They come in a variety of colors, spotted, white, sorrel, chocolate & black with gray-dun being the most common color. They have a dorsal stripe of darker hair down the length of the back crossed by a shoulder stripe. Life expectancy for these guys is around 30-40 years so they are truly a lifetime pet! We have found the most intriguing thing about these donkeys is their personality although their long goofy ears & VERY LOUD bray are pretty cool too. We have 3 of these little donkeys named Henry, Fanny & Amy. They are a perfect fit for our farm & we love them dearly! 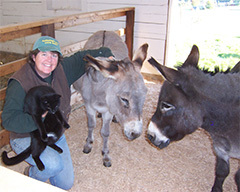 Henry is about 37 years old now & was born in Vermont at a donkey breeding farm. Fanny (15) & Amy (14) came from that same farm & are related. They are a perfect fit for our farm & we love them dearly! Their job is to help keep us all relaxed with their calm & soothing way.